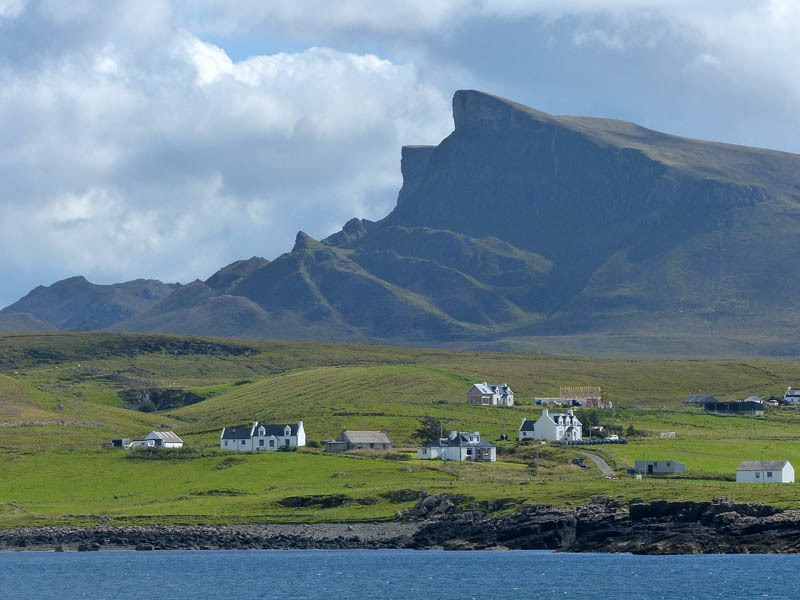 There’s a fairly straight, level and most enjoyable route to Sròn Vourlinn from the top of the road from Staffin to Uig – unfortunately, everyone else agrees with me, as the first part of the walk is also the route to the much better-known Quiraing. We’ll try to avoid the crowds, and begin the walk on the path from Loch Langaig, down on the main road near Flodigarry (see also “Quiraing – the other way“). The path ascends steadily until it reaches a cairn marking a sharp right turn, in a hollow below black cliffs and startling pinnacles. There are other walkers around – one or two have used our path from Loch Langaig – but when we continue along the ridge to the north, we’ve got the hills to ourselves. The views are tremendous and extensive, from the mainland mountains to the east, through a far-reaching seascape to the hills of the Western Isles. In the middle distance, with Lewis on the horizon, is Rubha na h-Aiseig. To the south, down the Trotternish ridge, the landscape is a tangled confusion of crags, cliffs and pinnacles. Just don’t get too close to that vertical cliff edge! Stunning photos of an epic landscape Geoff. The weather looks glorious too, which enhances the experience of that wonderful part of the World – makes my outlook of Bromlow Callow a wee bit tame by comparison. I do hope that you enjoyed your holiday.